Learn more about these functions by reading 5 Ways A Geotextile Can Improve Your Hardscape Design. With all of the different fabrics available in the market, choosing the right one for your particular application may be a tad daunting. In this blog post, we’re going to explain the four main types of geotextiles and the key benefits of using each. 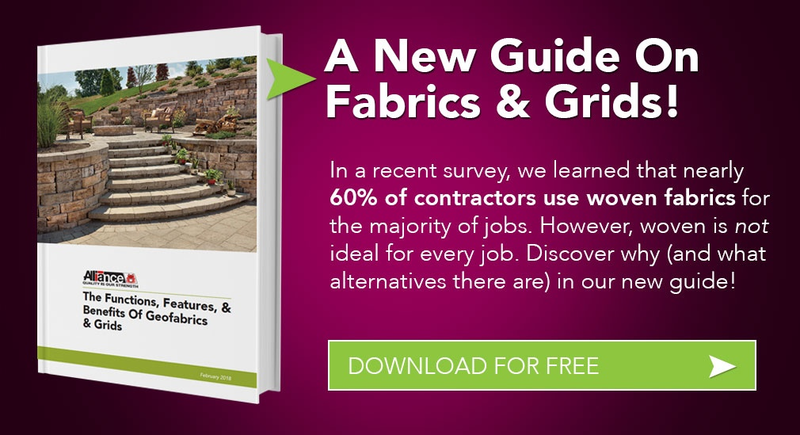 Everything there is to know about hardscaping fabrics and grids ... all on a single webpage. Discover it here! In the context of a hardscape project, it’s important to simply keep these stresses in mind when choosing a geotextile. Let's review these different types and how they can be affected by stress. Woven geotextiles perform the functions of separation and reinforcement. They are referred to by tensile strength and offer a very high load capacity. While woven fabrics are relatively impermeable and won’t provide good drainage, their high compressive strength makes them an ideal choice for roads, parking lots, etc. Non-woven geotextiles are felt-like and don’t offer much in the way of compressive, tensile, or shear strength. But that’s ok because their main functions are separation, filtration, and drainage. They are referred to by weight and ideal for any hardscape project where filtration or drainage is needed. Non-woven geotextiles can also be used for erosion control. Click here to learn more about The Difference Between Woven And Non-woven Geotextiles. Polyspun geotextiles are non-woven fabrics and their main function is separation. While they are permeable and provide drainage, they will not provide any reinforcement to a project. Polyspun geotextiles are referred to by lifespan and are most commonly used as weed barriers. In the world of fabric manufacturing, the spunbond process is considered the fastest manufacturing method for nonwoven fabrics. During the process, extruded filaments are spun onto a belt and bonded by applying heated rolls. Like polyspun geotextiles, spunbond fabrics will provide drainage but no reinforcement. They are referred to by weight and commonly used as weed barriers or as drainage fabrics. Now that you’re familiar with the four main types of geotextiles, which one is right for your next project? 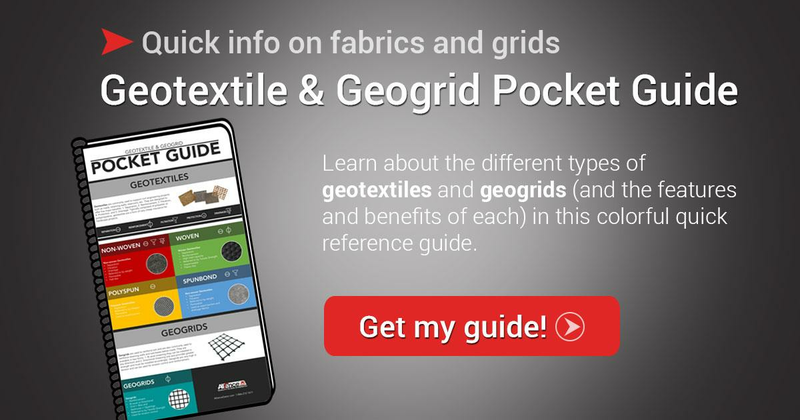 Download a copy of our Geotextile & Geogrid Pocket Guide to help you quickly decide!